Thiruvananthapuram: The ISKCON is conducting a programme here to propagate the values and message of Bhagavad Gita and Mahabharata following the recent controversy surrounding the Gita in Russia. A two-day interactive event titled ‘Parivartan’ will be held at the Vyloppilli Samskrithi Bhavan here from February 19, organisers said. The organisers said they envisaged the programme to remove misunderstandings about the Gita caused by the recent controversy. Manohar Gaura Dasa, local secretary of ISKCON, told a press meet here that all allegations against Gita were baseless and some vested sections were trying to run down the international acceptance of the great spiritual work. “The Russian Christ Mission became afraid and made efforts to ban it there. Even so, in the midst of all these problems, devotees in Russia have sold more than one lakh copies of the text there,” he claimed. 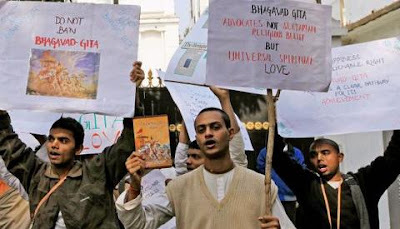 Last month, a Russian court had rejected a ban on a translated version of the Bhagavad Gita — a verdict welcomed by the Indian government as a “sensible resolution of a sensitive issue”.